SISContents is a software for computer that allows you to unpack, edit and sign SIS applications. It also helps you to see the files contained in the SIS app package and to see the certificate file used to sign the SIS application. It helps you to see the PKG scripts, which describes the installation process on your cell phone. SISContents helps yout to edit the files contained in the SIS package and Sign then using the custom certificate file. It allows you to Browse and read the contents of any SIS package or Application. It allows you to unpack any files from the SIS application. You can extract embedded components of the SIS application as sis files, including its certificate and signature files. It allows you to view PKG installation scripts and save it to your computer. It helps to view and extract images and edit the multibitmap files in the sis application. It helps to extract and edit contents of Mif files in the sis application. It allows you to Sign any SIS application and see the certificate information including its validity period, Subject and also delete them from the SIS application. It helps you to create SIS application from the PKG scripts. It also supports N-Gage applications. SISContents is compatible with the Windows XP, Vista and Windows 7. In case you are using Windows 8 then Setup compatibility mode to Windows XP service pack 3 from the Properties. Note: SISContents is a portable software, which means it does not require you to install it to your computer. Simply Extract the .zip file on your desktop and run extsis.exe. There is a SIS file Editor available for Nokia Belle, Anna and Symbian phone, which allows you to edit any .SIS package from your phone itself. 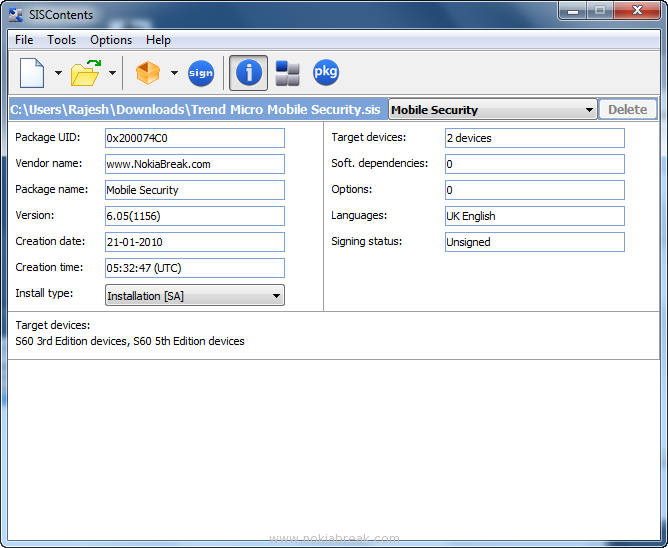 In case you want to edit Nokia Firmware files then you can use Nokia Firmware Editor.